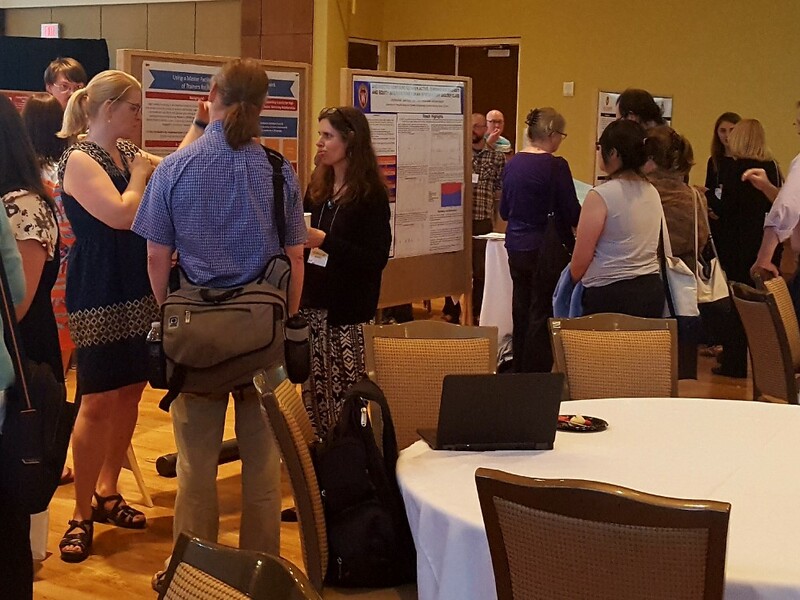 At this year’s Teaching & Learning Symposium on May 17, 2018, DoIT Academic Technology team members shared their expertise on online learning, Engage eText, Canvas, designing curriculum for high-enrollment courses, and learning analytics. In addition, Blaire Bundy, Service Leader of Strategic Learning Technology Consulting (SLTC), served on the planning committee for the event, which DoIT AT helped sponsor. Greg Konop, Service Leader Supervisor of Online Course Production and Video Production, presented “EI Online Learning Initiative: UW Online Course Instructional Design Inventory” in the morning with Steven Cramer, Vice Provost of Teaching & Learning, John Zumbrunnen, professor at the Department of Political Sciences, and Steven Boldt, Director of Online Program Development at the Division of Continuing Studies. In addition to providing an overview of the Educational Innovation (EI) Online Learning Initiative, the session focused on the goals, process, rubric and results from the Online Course Instructional Design Inventory. The project identified over 375 online courses at UW-Madison and for about 150 of the courses, instructors were interviewed by their peers over seven months. The results showed 92% of the courses had defined course-level learning outcomes and 94% included regular and substantive student-to-instructor interactions. Participants also helped brainstorm how the Wisconsin Experience could be incorporated into the online environment for different audiences such as “traditional” residential students looking to take an online course, adult learners wanting to finish their degree online, and learners looking to earn a degree fully online. 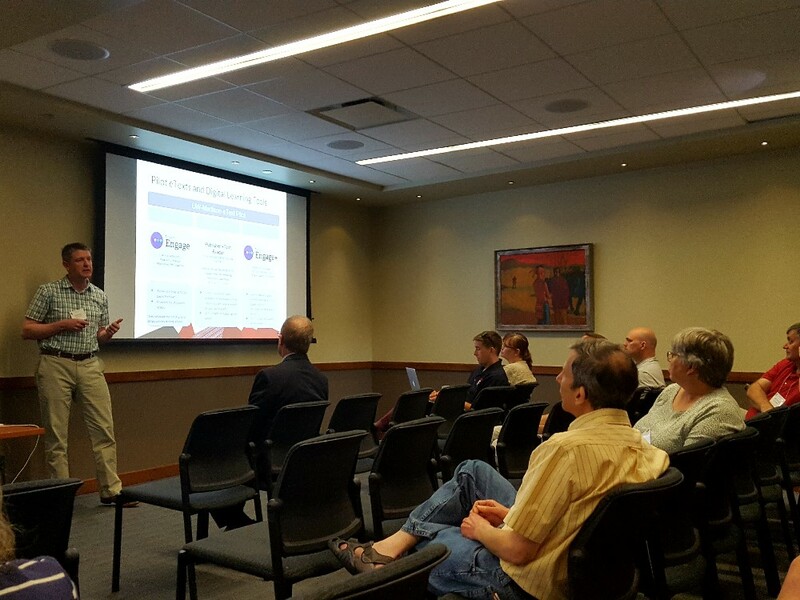 In the afternoon, Dan LaValley from Learn@UW-Madison joined Steven Cramer in presenting “Reduced Costs, Richer Experience: Engage eText Pilot” and providing a demo for attendees. The presentation included preliminary findings from the spring pilot as well as the process for the fall pilot, which are outlined in the presentation slides. A critical part of the Engage eText Pilot success is the support team that includes staff from the Office of the Provost, Office of the Registrar, Office of Student Financial Aid, College of Letters & Science’s Learning Support Services, Bursar’s Office, DoIT Financial Services, as well as DoIT Academic Technology’s Learn@UW-Madison, Learner Digital Ecosystem, Evaluation Design & Analysis and project management teams. Another breakout session was focused on a project long past it’s pilot stage. Cliff Cunningham from Learner Experience: Training & Support conducted the “Getting Started with Canvas” training for instructors preparing for the transition to Canvas as the single, centrally supported learning management system as of June. “We’ve been providing this training as well as others on file management and grades for the past two years,” notes Cliff. “It’s been a pleasure for me to learn about the wide variety of courses and then work with instructors on using Canvas to help improve the experiences of both instructors and learners.” Attendees were so engaged, that some stayed late to learn more from Cliff. Additional Canvas trainings are planned through summer and can be viewed in this calendar. 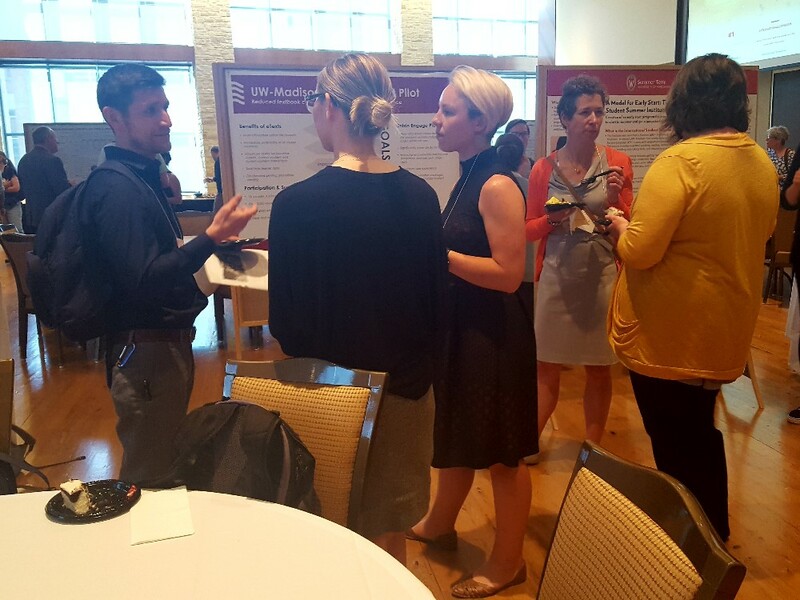 The day completed with the poster session and in addition to the Engage eText Pilot, DoIT AT team members shared updates on REACH and a course-level dashboard prototype for instructors. l. Sarah Miller, Service Leader Supervisor of Faculty Engagement and Strategic Learning Technology Consulting, presented the “REACH: Redesigning Active Learning in High-Enrollment Courses” poster. Kimberly Arnold from Evaluation Design & Analysis, Kari Jordahl from Online Course Production and James McKay from Learn@UW-Madison presented “Creating a Course-Level Dashboard for Teaching & Learning.” In addition, there was a special rapid review session for instructors to provide feedback on the dashboard prototype, which Garrett Smith from Teaching & Research Application Development has developed. 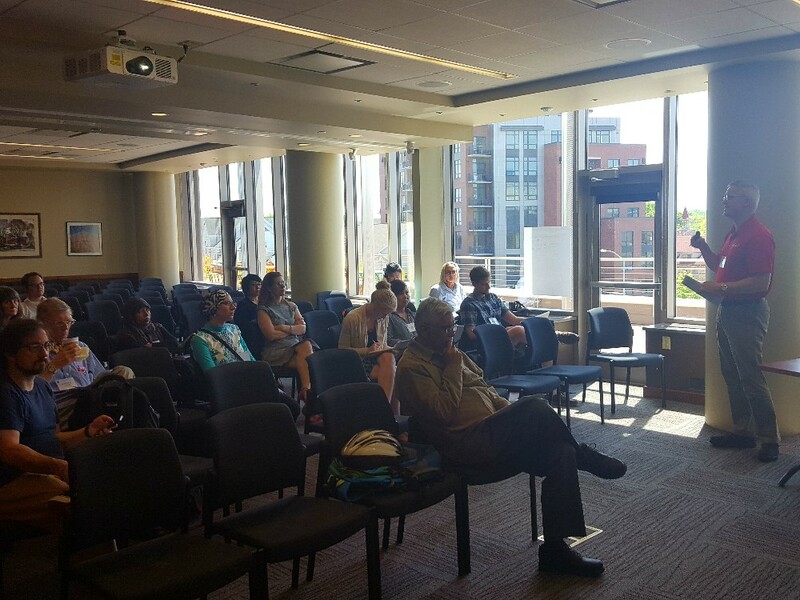 These brief one-on-one conversations with instructors were facilitated by team members including Cid Freitag from Faculty Engagement, Jim Burling from Online Course Production and Blaire Bundy, along with Xizhou “Canoe” Xie from the Wisconsin School of Business. 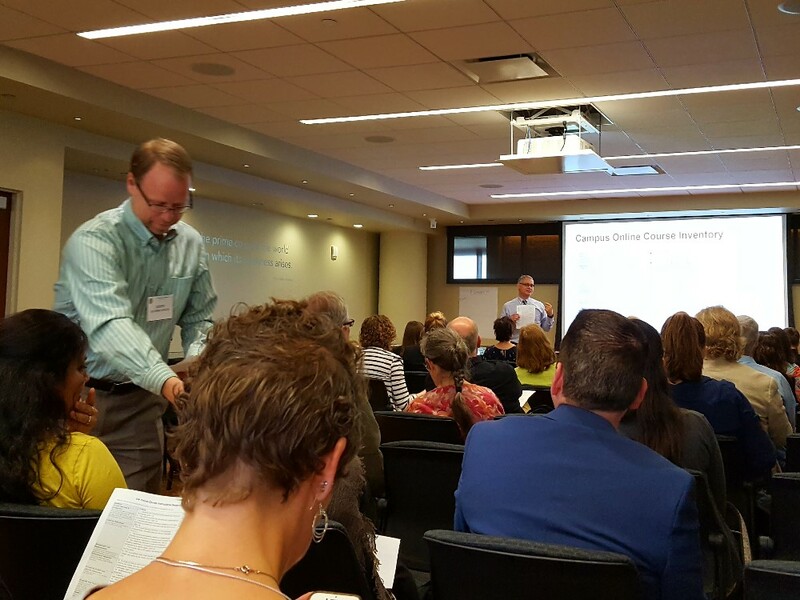 Check out photos from the T&L Symposium below. Greg Konop explains the rubric for the Online Course Instructional Design Inventory as John Zumbrunnen passes out copies to the full room. Dan LaValley explains the different eTexts and digital learning tools that are eligible for the Engage eText Pilot. Cliff Cunningham explains the basics of Canvas to prepare instructors for the transition to Canvas as the single, centrally supported LMS. 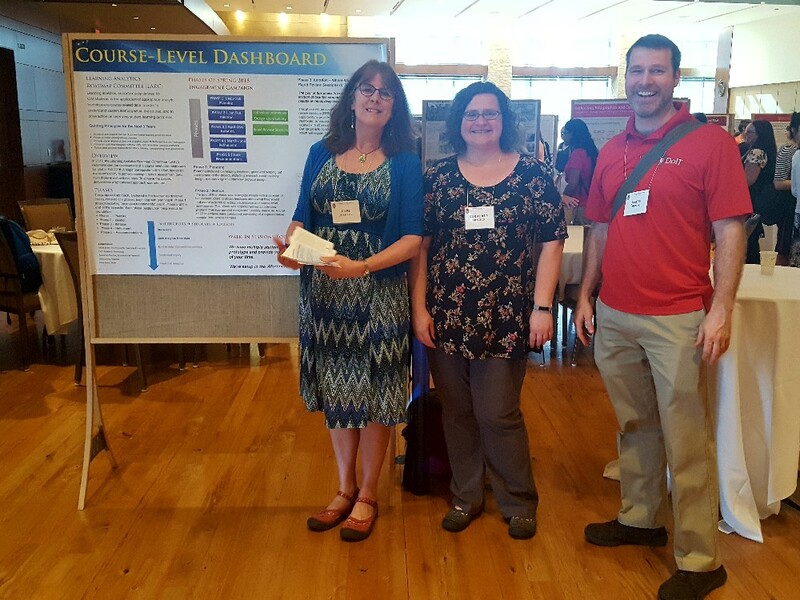 Kari Jordahl, Kimberly Arnold and James McKay present their poster on course-level learning analytics. Project managers Katie Free, Hannah Kinley and Nicole Olthafer engage with attendees about the Engage eText Pilot. Sarah Miller (far left) explains how the REACH initiative helps improve student learning by increasing students’ engagement in large introductory courses that participate.